This past weekend was the main virtual stamping night on Splitcoaststampers...this time the theme was "On Cloud Nine". I was lucky enough to get to host the first challenge of the day on Saturday. My challenge was called "Not a cloud in the sky"...to make a card with lots of white space. There were lots of great cards made - feel free to check out the gallery for my challenge! The great news is there is still time to play in any of the challenges...the deadline is Monday, November 15th at 10pm EST. 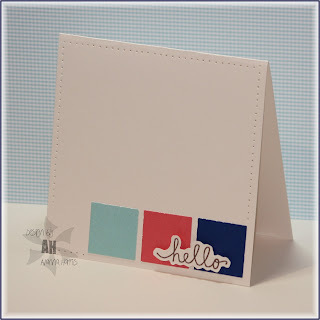 This would be great for scraps in any colour combo you choose...I used a 1" square punch, fussy cut the sentiment and adhered it over the squres with pop dots. To finish, I pierced a border around the card. I hope you can find the time to make a card for my challenge...I get to choose a winner when it's all said and done...it could be you!